Welcome to The Hill at Wright Farms where we have created some of the most memorable weddings in our area. 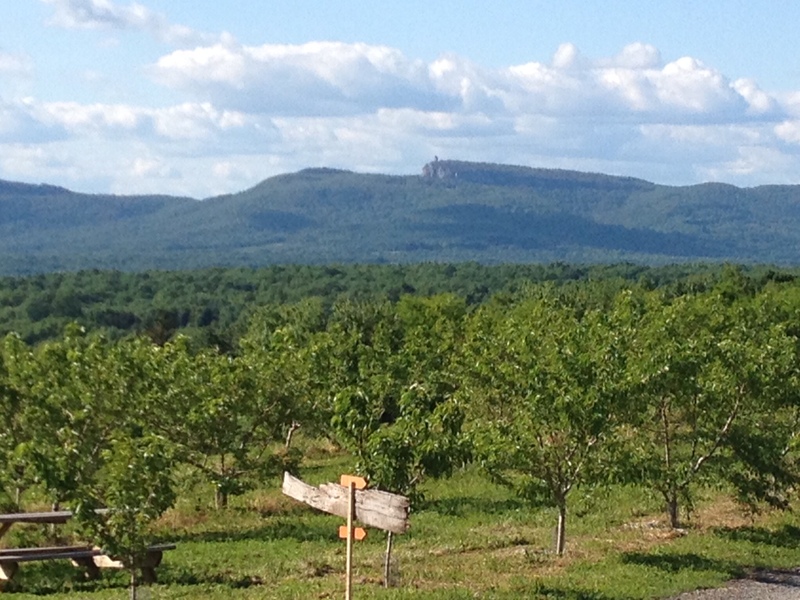 This site is wrapped in apple and peach trees waiting for you to create the most beautiful wedding ever. 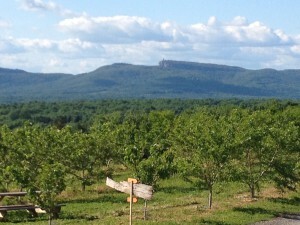 The uniqueness of this site includes fabulous view of the Shawangunk ridge, privacy and seclusion. Will my wedding cost less than an indoor wedding? Probably not. But it certainly will be the most memorable for you and all your guests. What is the cost of the venue? What is included when I rent the venue? An awesome view with nothing but the Shawngunk Mountain Ridge and farmland all around you ~ torches surrounding the patio and parking area (over 60)~ wedding site available till 11:00 pm ~ setup of tables, chairs, dishes etc…~ uses of our farm for engagement photos ~ site available 2 days prior to wedding for setup~ we over see all the vendors so you don’t have to. Signage for your guest to find venue~final clean up so you don’t have too…. Can I have my ceremony at the venue? Yes. You will need to arrange for seating and a tent if weather is a problem. We can provide straw bales for a country feel for an addition charge. This is your back drop for the ceremony. Do I need to get event insurance? You will need to purchase event insurance. This cost about $200. How long can my event go till? When can I begin setting up for my event? 2 days prior to date. What is the maximum amount of people I can have at my event? Does the venue come with a tent? No because every event is different. Therefore a different tent size is needed for each event. You may pick the rental company yourself or you can use our preferred vendor Durant Party Rentals. We can contact them for you or you can contact them directly. They have everything you need to finish off your wedding. No. Only if the chance of rain. You can setup streamers or balloons etc…. The sky is your limit. When can I set my tent up? You have 2 days before your wedding to have the tent company setup your wedding tent. Does the venue have electricity? No you’re in the middle of an apple orchard. You need to rent a generator from the tent company or borrow one from a friend . They rent for around $100. A small generator is enough to generate electricity for under your tent, restrooms and music. Do you have any farm props to make my wedding more rustic? Yes. We have tons of items you can rent for your special day. Check out our rental tab. If there is something we don’t have please ask us. We probably have it. We just forgot to list it. Can we camp at the wedding site for the night? Yes. You can absolutely camp on the wedding site. The cost is $75 per tent. Do I need to use your caterer? No. We do not work with any preferred caterers. You can use whoever you’d like. We can recommend some really great caterers in our area though. Wright’s Farm now has Gardiner Brewing Company on site. Can we serve that craft beer at our wedding? Yes we now have our licenses and are ready to make craft beer for your wedding. We are also allowed to sell local wine and spirits. I do not want to use Gardiner Brewing Company for my wedding. What do I need ? Your caterer must have an alcohol license. Hope this helps answer most of your questions. For more information email us or call us at 845-255-5300.